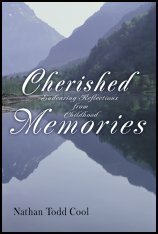 Cherished Memories: Endearing Reflections From Childhood is an intuitive and effectively written memoir of the youthfully active childhood once lead by Nathan Todd Cool. As an eclectic and knowledgeable author, Cool brings personally insightful as well as fun stories into this collection of his past, Cherished Memories gives readers a true feel and connectivity to the intimate life of the writer. Cherished Memories is a rare and enthralling memoir, very strongly recommended to all non-specialist general readers with an interest in the autobiographical depiction of a man that may be recognized as an instantly engaging storyteller and worldly intellectual. Nathan Todd Cool's collection of childhood memories, found in Cherished Memories (Endearing Reflections from Childhood), are pleasant and entertaining enough, but the real strength lies in the way that Cool successfully encourages the reader to not only remember memories but also make new memories of his own. Cool has divided his memories into categories such as Food, All of God's Creatures, Firsts, and several others. The memories evoked will depend on the reader's frame of reference. The sections on Water, Water Everywhere and Fishing do not affect many memories for me, but those on Food, Firsts and Tell Me a Story bring to mind several other memories. Any reader can identify with Firsts: first girl friend, first driving and other firsts in his/her life. Everyone needs memories. They keep the wolf of insignificance from the door -Saul Bellow. At the end of the book in Parting Words, Cool again admonishes us to make memories while we can. Cool writes, "You can spend your time working hard all your life, but you may be robbing that time from those things most precious to you, family, friends and laughter among others." A delightful collection of memories.